Lest readers should get the idea that battles during the American War for Independence were often patriot victories, we’ve chosen an indecisive battle for today. 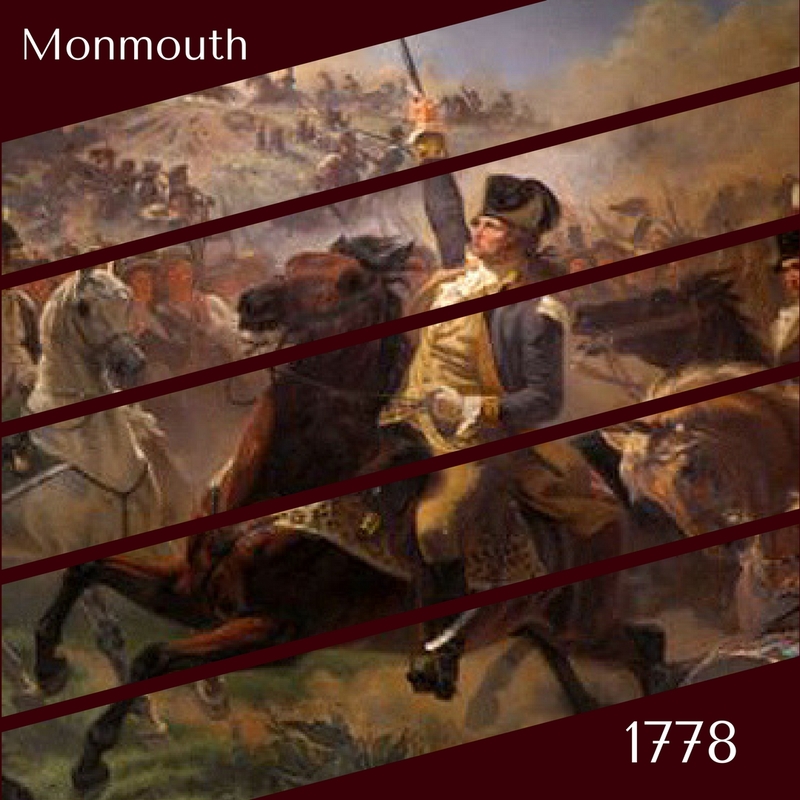 The Battle of Monmouth Court House took place in June 1778, marking a change in British strategy. The battle itself unfolded with plenty of drama and even gifted the treasury of American tales with the story of a brave woman. Following British General Burgoyne’s surrender at Saratoga in 1777, the English decided on a new strategy for beating the rebel colonies in 1778. 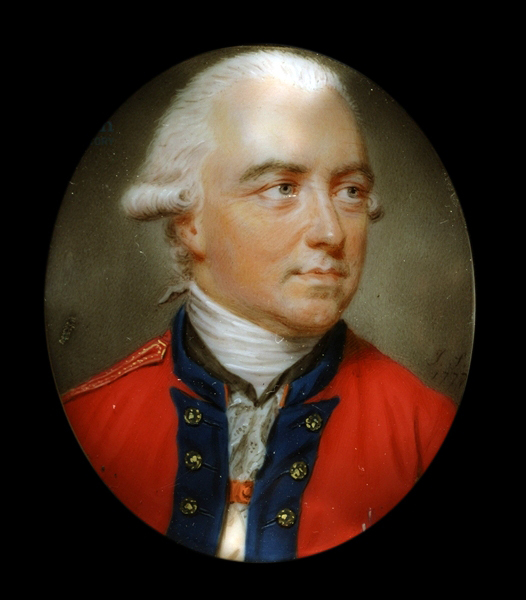 Their new commander – Henry Clinton – had orders to consolidate the crown forces and fight a defensive war around New York City. On June 18th, the British began their retreat from Philadelphia and headed for New York. Originally, they had hoped to travel by sea, but time was important…and a French fleet had left Europe and was supposed to join coordinate with the Americans to block the British. The Americans moved ahead and around the British columns, mudding drinking water, destroying bridges, making road blocks, and trying all kinds of other tactics to slow down the enemy army. George Washington struggled to determine his strategy; eventually he sent General Charles Lee to attack the British rearguard near Monmouth Court House (New Jersey), hoping to slow the march and allow the rest of the Continental Army to choose battleground in a strong position. June 28, 1778, was a blistering hot day. Soldiers in both armies suffered from heatstroke. With the weather already against his troops, Charles Lee started launching piecemeal attacks at Monmouth. After several hours of fighting, the American troops withdrew, then started a regular retreat. We usually think of George Washington as staid, calm, and unruffled by circumstances. However, when he saw the retreating troops and found Charles Lee, Washington exploded verbally. Lee was eventually sent to the rear while Washington and his other commanders rallied the troops and established new battle lines around Monmouth Court House. Both British and Continental Soldiers attacked and counter-attacked through the hot afternoon. Eventually, the heat of the day limited, then ended the infantry fighting. The artillery duel continued into the evening though, making one of the largest cannonades of this war. In the night, the British withdrew and found protection under the guns of their navy, leaving Washington and the Continentals in control of the battlefield, but without a decisive victory or hindrance of the British movements. Thus, the Battle of Monmouth Court House is technically an indecisive battle. 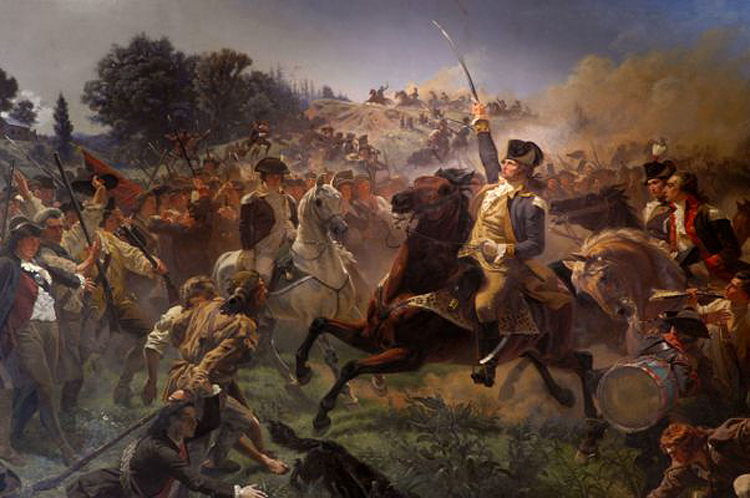 For the Americans, the battle was significant because it was their first major fight after their training at Valley Forge, boosting confidence and morale. While it’s important to acknowledge that this story associated with the Battle of Monmouth might have incorporated several women’s actions on different battlefields as the legend grew, here’s the way the story goes. Mary (Molly) Ludwig Hays had spent the winter with her husband at Valley Forge. She and other women volunteered to help with laundry, cooking, nursing, and water carrying to support military units. During the June 28th battle, she carried water from a nearby spring to her husband’s artillery unit and to the nearby infantrymen. Supposedly, the soldiers called “Molly, pitcher,” requesting water on that hot afternoon. It’s not clear if Mr. Hays collapsed with a wounded or a heat-related illness, but either way, he was incapacitated and no longer able to oversee or work his artillery piece. Molly jumped into action – swabbing, loading, and firing the cannon throughout the afternoon artillery duel. 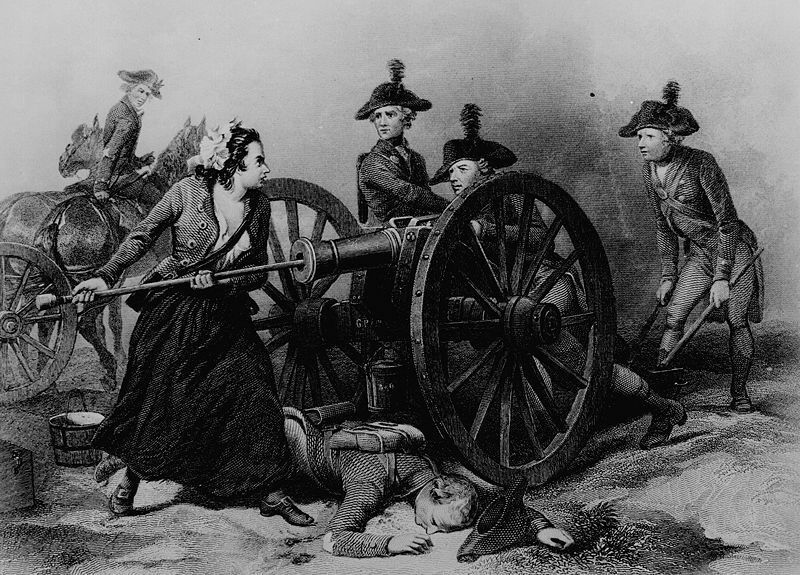 After the battle, General Washington asked about the woman at the cannon. He awarded her a warrant as a non-commissioned officer for her bravery.